In the past year, devastating wildfires, hurricanes and blizzards have had major impacts on organizations across the country. Communicating how natural disasters will impact schedules can be challenging, especially with larger organizations. No one wants to put their staff in harm’s way, but it’s important to keep everything running efficiently if possible. Using an emergency notification system to share messages with staff about what they should do before, during and after a natural disaster helps minimize downtime and keep people safe. In this blog post we’ll outline best practices for communicating with staff about natural disasters. 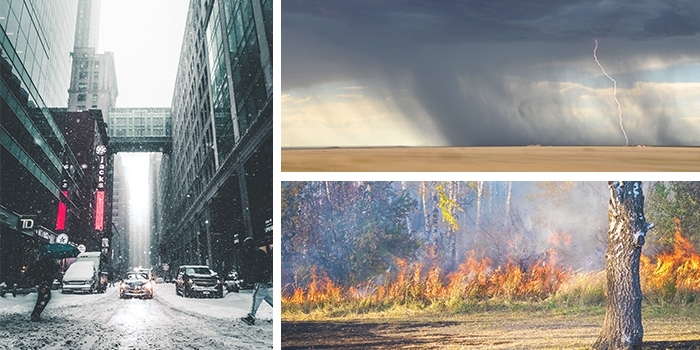 Natural disasters like wildfires, hurricanes and blizzards often give organizations time to prepare in advance. Depending on where an organization is located, plans should be in place for how to deal with different natural disaster scenarios an organization is likely to encounter. Having prewritten messages that explain severe weather is approaching and what impact it will have on day-to-day operations saves time, since administrators don’t need to worry about what to say, and instead can focus on other preparations. Include clear instructions about what people are expected to do, whether that’s staying and working from home, or giving themselves adequate time to get in in the morning. Be sure to leverage as many communication channels as possible to ensure everyone gets the message and that there is no confusion about what an organization’s plan is if a natural disaster strikes. Some events occur suddenly, or the severity of an anticipated event can increase unexpectedly. Messages sent to staff in the midst of a natural disaster should include relevant safety instructions. If offices are already closed, tell staff to staff away and off the roads. For particularly intense situations, it may be beneficial to tell them to listen to government officials about how to best stay safe. In the case that people are on still on-site when disaster hits, mass notification messages should be broadcast on every channel with instructions for where people should go to stay safe. Having designated safety areas in the event of hurricanes or tornadoes helps direct people out of harm’s way. Emergency notification systems can also be used to confirm people’s safety and gather key decision makers. Some systems offer mobile messaging that allow recipients to respond to the message. They can signal if they need assistance or if they have reached safety. Another useful feature is emergency notification systems that trigger conference calls. This can help gather the right people quickly to begin coordinating a response. Once a natural disaster event has concluded, an emergency notification system can be used to provide updates about the status of an organization. Letting people know if there will be continued closings, or if buildings have been damaged, lets people know they should stay away. If buildings need to be closed for extended periods of time, an emergency notification system can be used to alert employees, as well as display messages on devices like digital signage to alert others. On the flip side, emergency notification systems can be used to communicate that it is safe to return and that operations have resumed a normal schedule. Systems that let administrators know when a message had been read by staff members minimizes worry about staff members not showing up for their shifts.